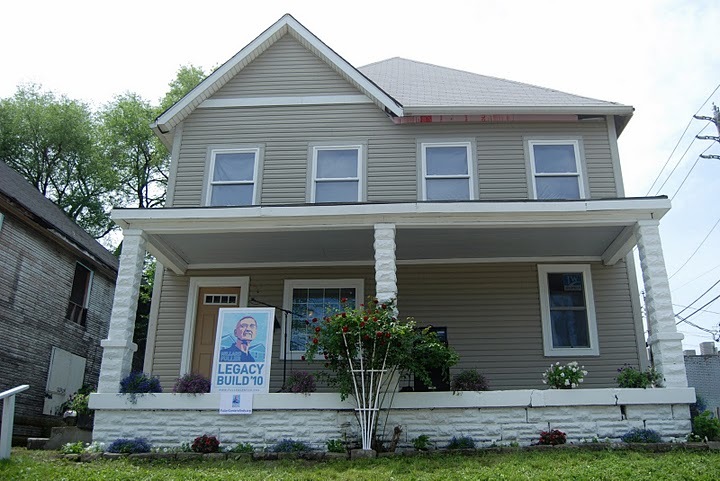 After a week of renovation work, the first Millard Fuller Legacy Build home was dedicated on Friday, May 14 in Indianapolis, Ind. 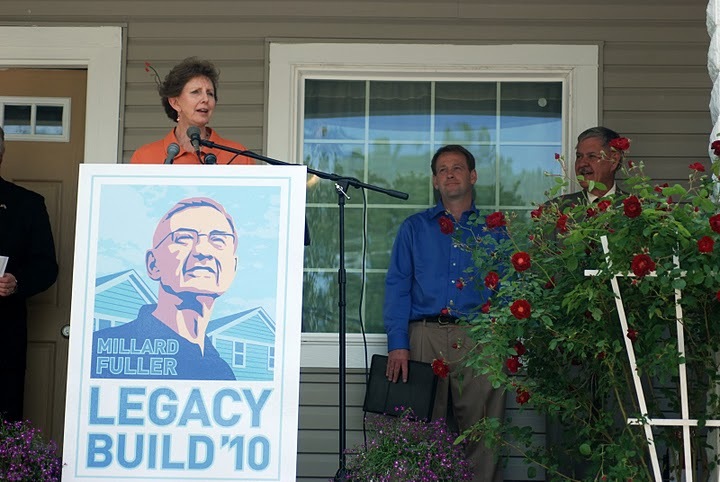 Thanks to The Fuller Center of Central Indiana and many local volunteers, the Martinez home will soon be finished and was the first of at least 100 homes that will be dedicated worldwide in honor of the Millard Fuller Legacy Build, happening September 6-10 and centered in Indianapolis. Lesley Martinez and her husband, Patricio, bought their house on St. Paul Street last September. It was a complete wreck, but they had been looking for a house they could afford to buy outright. Also, their rent was expensive, and they were eager to move their two children into a better home. "We prayed about this for months, we kept praying for a house," said Patricio. The house they purchased was constructed around 1900 and suffered endless years of neglect and abuse. But Patricio works for a construction company hanging drywall and knows how to do everything one needs to know to build a house. "When we first came to this house, everything was falling down," he said. "The whole back of the house was gone." But the house was theirs. With the help of his brother and friends from church, Patricio worked on it every weekend and in the evenings after he came home from work. Four months after purchasing the house, Patricio had framed new walls and floors, repaired the mechanical systems and installed new insulation, windows and drywall in half of the house. Before the volunteers swarmed the house, it looked as bad outside as it did when the Martinez family purchased it. The north side of the house was scorched from an arson fire that destroyed an adjacent garage. The roof was covered in worn, mismatched shingles and most of the windows were boarded. Money was too tight to do more extensive exterior work, but when volunteers arrived to complete what Patricio started, they also found the wood floors refinished and the smooth, new walls neatly painted. Fuller Center President David Snell wrote about the providential confluences of the Martinez house on his blog: "The Martinez home was a crack house before it was reclaimed. It turns out that Mr. Martinez is actually Pastor Martinez, so The Fuller Center has turned a crack house into a parsonage!" Read more here. Fuller Center Co-Founder Linda Fuller led the dedication ceremony. Other notable attendees at the dedication included Indianapolis Mayor Greg Ballard; event co-chairman Jim Morris; City-County Councilman and Fuller Center Board Member Jeff Cardwell; Rev. Wayne Murray, senior pastor of Grace Assembly of God; and the Indy 500 Festival princesses. Among the dignitaries at the event was Mark Stewart, who heads South East Neighborhood Development (SEND) in Indianapolis, without whom this project wouldn’t be possible. SEND donated the land, site development and foundations for the project. This is an outstanding example of the power of partnerships! Don’t miss out on being a part of the powerful experience that is the Millard Fuller Legacy Build! Click here to learn more and register to join us in Indianapolis.